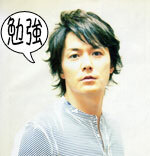 The first version of this song was used as the theme song to Fuji TV's drama "Water Boys" in 2003. The second version of this song ("niji ~mou hitotsu no natsu~") is used as the theme song to the sequel of this drama "Water Boys 2" in 2004. I wonder if you'll smile for me? I wonder if we'll meet again?